Herbs and spices are derived from every part of a plant: root, stem, leaf, seed, bark, pods, stamens and fruits. What I would like to do is familiarize you with the more popular herbs and spices in use and some that I find to be a great addition to certain dishes. Allspice: A truly Jamaican spice. Derived from the berries of a tall, evergreen tree that grows primarily in the West Indies. Jamaican Allspice is considered the finest in the world. Allspice mostly resembles clove, but with hints of nutmeg, cinnamon, and ginger. Allspice is generally used in desserts, pies, and pickling. Anise: Also called aniseed, a licorice flavored seed with just a touch of heat used in baking, cooking, also for the French alcoholic drink Anisette. Basil: One of the more popular herbs, basil plants come in two varieties: sweet and spicy. Although the sweet variety is slightly spicy at the bottom of the leaf, the top of the leaf contains most of the oils which round out the flavor. 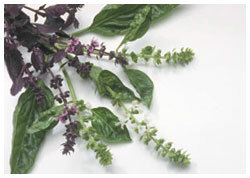 Spicy basil tends to have purplish leaves and a reddish stem. The leaves of the basil plant can be used fresh in salads, as a finishing touch to soups or sauces, or dried to be used in marinades, or bouillon. “Poet laureate” and the academic term “baccalaureate”. The leaf itself may be used fresh or dry in a variety of dishes, stocks, soups, and as a necessity in a bouquet garni(a bundle of parsley, thyme, and bay leaf tied together alone or in cheesecloth and incorporated in stocks and soups according to taste). Well, a caper is the bud of a shrub grown in the Mediterranean and packed in salt or brine. They can be used in sauces, like remoulade, as an accompaniment to fish dishes, or an addition to a dish with the juice and/or zest of a lemon. Cardamom: The seed of the plant is the actual spice, but often it comes in the pod, dried. Unless you get it in powder form, it is necessary to grind it in a mill or with a mortar and pestle and separate the shell from the seed using a sieve to separate them. With hints of coriander and white pepper, cardamom is commonly used in pastries like apple pie, breads like brioche, an additive to a coffee blend, or as an addition to sausages and ground beef. Chives: Part of the onion family, it is the stem of a wild onion that is young and tender. The longer it grows the tougher and more sinuous the stem becomes, but the end product of a chive blossom is an equally wonderful herb. Used whole or plucked, the blossom can be used in a variety of beautiful garnishing techniques. The tender stems of a young chive may be finely chopped or cut longer into batons for a garnish that adds more to the flavor of a dish that just its presentation. Cilantro: The leaves of the coriander plant, cilantro is widely used in salsas and sauces. The leaves must be used fresh and right before service. When dried, the leaf looses its flavor. Cinnamon: The bark of a tree that grows in Ceylon. True cinnamon is quite expensive and rare. The more widely used “cassia” most often replaces what we call cinnamon. Cassia is a larger tree with a thicker bark and stronger flavor than that of the “true” cinnamon tree. Clove: The dried bud of the clove tree, cloves may be used in a variety of ways: Seasoning meats, desserts, sauces like ketchup, used in distilling liquors, in curry powder, and in warm beverages like mulled wine. Coriander: The fruit or seed is considered the actual spice. With hints of orange, pepper, and cardamom, the seeds are dried and used in a number of dishes, candies, and beverages. Cumin: The seed of the plant is dried, and toasted for use in breads, liquors, curry powder, chili powder, cured meats and chutneys. The cumin seed has recently experienced a surge in the US with its use in southwestern and Latin American dishes. Curry Powder: The term “curry” is the actual dish, not the spice. The spice is actually a blend of many spices ground to a fine powder. Some mixes may contain as many as thirty spices. This is why it is mainly mixed and sold as its end product. For those interested in making their own, here is a list. Most mixes start with cardamom, coriander, clove, cinnamon, cumin, pepper, and turmeric with the addition of, aniseed, ginger, fennel, fenugreek, bay leaf, mustard, or saffron to taste. Dill: A very old herb that has a wide range of uses. From its use in salads, potatoes and other vegetables, and of coarse dill pickles, to salmon, chicken, lamb, and crab. Fennel (leaves and seeds): Fennel, with the unmistakable scent and flavor of licorice, has a number of uses. The seed may be ground or used whole in soups, breads, stuffing, and a key spice in many sausage mixes. The tender leaves make an excellent garnish for fish dishes and soups. The stalks make a good addition to stocks, and the bulb itself may be chopped, sliced, or shaved and incorporated into salads, and side dishes. Fenugreek: A type of pea plant, the pod of the plant house seeds that taste bitter in their raw form but, once cooked, the seeds take on a sweet, maple type flavor. It is commonly used in spice mixes and chutneys. Garlic: A member of the onion family, garlic is widely used in a number of dishes. Preferably fresh, garlic is also suitable for drying and ground for garlic powder. Garlic is considered one of the indispensable spices in cooking. Ginger: Not the root of the plant as some people believe, but the rhizome (the underground stem) of the plant. Ginger is a spice than is used predominantly in Asian and other eastern cuisine. Also when dried, it is the key ingredient in gingerbread, gingersnaps, ginger beer, and ginger ale. When using dry ginger, add slowly for the dried version is much hotter than fresh. Juniper Berries: The dark, round fruit of the juniper bush has the fragrance of an evergreen tree, predominantly used in the production of gin, this spice also has a very good flavor in marinades for wild game such as venison and elk. Lemon Grass: A long grayish-green stalk that is quite fibrous. Lemon grass is used primarily for its flavor rather than the content of the herb itself. After incorporation into a dish it is removed, leaving a unique flavor with a hint of lemon. Mint: Of the many different types and hybrids of mint, (almost six hundred) spearmint and peppermint are among the most common with peppermint a bit spicier than spearmint. Mints are widely used in confections, desserts, beverages, jellies, and as a garnish. Mustard: The seed of the mustard plant is dried and ground for use in prepared mustards and seasoning in salad dressings, or used whole in pickling. Mustard makes a good addition to a variety of dishes, sauces, and dressings. Mace & Nutmeg: The tropical evergreen tree that produces nutmeg can grow to a height of sixty feet and a most colorful tree it is. The fruit itself has an abundance of uses. The outer flesh may be used in jams and jellies. The inner core produces two spices, nutmeg and mace. Mace is derived from the crimson covering, or aril, of the core. The core itself encloses the oily “nut” which is nutmeg. Best served fresh, nutmeg should be grated over a dish in its final presentation to give the maximum potency. Marjoram & Oregano: Both of these herbs belong to the mint family and are quite similar to each other in taste and aroma, with oregano possessing a slightly earthier flavor. Used primarily in Italian and Provincial cooking, these herbs are indispensable for the so loved pizza, and marinara sauces. Both can be used in sausage mixes, marinades for veal and fowl, salad dressings and vinaigrettes. Paprika: Made from red pepper that has been dried and ground to a fine powder, paprika comes sweet or hot. The strength of paprika depends on the amount of seed and rib from the pepper that are present at grinding. Hungarian cultivation and production of paprika has long been considered the finest in the world. Parsley: There are two varieties of parsley. Curly leaf and flat leaf, or Italian parsley, both may be used for the same purposes, but, Italian parsley tends to have a richer taste and is thus preferred over the curly leaf. The stems are used in the making of stocks and sauces. The leaf may be chopped and mixed with other herbs as a filler and addition to enhancing the flavor to a dish. The leaves are also chewed to take the scent of onion and garlic away from the breath. Pepper: The fruit of a plant that grows as a vine. The different varieties of pepper are all derived from the same plant; just the degree of maturity separates the flavor and intensity of them. Green peppercorns are the youngest of the fruit and are frequently packed in vinegar or a marinade and used in sauces or accompany meat dishes. White peppercorns are the most pungent and are derived from the fully matured, red peppercorn which is soaked to remove the outer skin and dried. Black peppercorns are the “half ripe” fruit that is allowed to ferment and then dried. Pepper is an essential spice in cooking. Use the whole peppercorn in soups and stocks for a slight flavor or ground on meats for grilling, and freshly ground on salads. Pepper used directly after crushing or grinding is best. The oils and intensity dissipate quickly after being ground. Rosemary: The thin, needle-like leaves of the rosemary bush are one of the more popular herbs. Best when chopped fine to bring out the full flavor, rosemary is used to season meats such as, lamb, beef, and wild game. The flavor of rosemary is also enjoyed in boiled and roasted potatoes. A very pungent herb, rosemary should be used sparingly or try mixing it with parsley. Saffron: The fine, red stigmas of the crocus plant, saffron is quite strong and is best used in an infusion of stock, water, or white wine and then added to the dish. A good amount of liquid should be used to fully bring out the flavor, also, keep in mind saffron has a pungent flavor. A little goes a long way. For rice or something similar it is best to remove the saffron before incorporation as it will stain the surrounding food. Salt: The most important seasoning in cooking, without a doubt. Salt is a mineral that is mined or taken from the sea. Coarse kosher or sea salt are often preferred, but it is really a matter of taste. The most important thing to remember when adding salt is to add little by little. You can add more but you cannot take it out. If you can taste the salt, you added too much. Sage: The long, grayish green leaves and shoots of the sage bush are, like rosemary, very pungent and should be used in small quantities. Sage is most popular in stuffings for fowl and in marinades and rubs for lamb, pork and wild game. Tarragon: This highly aromatic herb has the scent and taste of licorice with a hint of acidity. As the key ingredient in a béarnaise sauce, a reduction is made with vinegar and whisked into Hollandaise sauce. Tarragon is also used to flavor vinegars for use in salad dressings. Once again, tarragon is quite a strong herb and should be used sparingly. Thyme: One of the most diverse herbs, thyme may be used in any number of dishes to give a slightly sweet, earthy flavor. Any food, whether it is a meat or vegetable, can benefit from the use of fresh thyme. Garden or English thyme is preferred to the wild variety, which has a weaker flavor. If you have the fortune to come across lemon thyme, the earthy, sweet flavor of English thyme and lemon, I highly recommend its wonderfully distinct flavor. Turmeric: Like its relative ginger, turmeric is a rhizome. Often replacing saffron for its coloring agents, turmeric is also a key ingredient in curry powders and adds a peppery, musky flavor to a dish. Vanilla: The long, thin pod of a tropical plant that has no flavor when picked. The vanilla pod or bean is cured for several months in which time crystals called vanillin are extracted from the pods covering and scent the inside of the pod. The bean is cut lengthwise and the tiny, black seeds are extracted for use in beverages, desserts, sauces, and ice cream, steeping the bean in alcohol makes vanilla extract.